This is it. At long last, the NZTA transport planners who were defeated over the Basin Reserve flyover are going to put their new plans on the table. Be there to have your say – see below for when, where & how! RSVP by Tuesday. If the invite links below don’t work for you, urgently email info@getwellymoving.co.nz for an invitation, or just tell them you plan to attend the event. Be polite, but be resolute. Don’t let the short notice or the bad timing of this ‘consultation exercise’ stop you. NZTA have refused to rule out proposing another flyover at the Basin Reserve. Are you going to let them get away with that? Be there if you possibly can: Prefab, this coming Wednesday, 15/11, 6.30pm. To make Wellington more liveable and support the region’s growth we need to change the way we move in, around and through the city. Last year we asked the people of Wellington what they think about Wellington’s transport. Now we’re back with some possible future scenarios that aim to move more people without more traffic. We’ll be seeking the public’s feedback on these in late November and early December to help us develop a preferred scenario. We’d like to invite you to the launch of our public engagement on the 15th of November, so we can share with you our ideas to Get Wellington Moving. 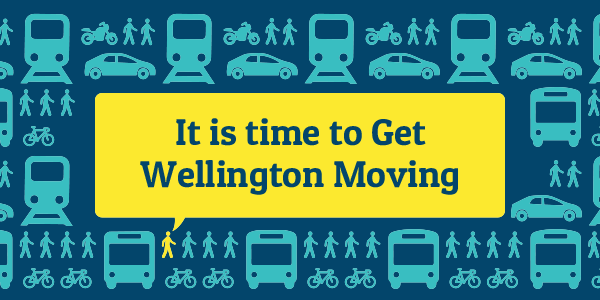 In an earlier post, we told you about the importance of submitting on Wellington’s Draft Regional Land Transport Plan, which local body politicians use to set transport priorities for the city. Submissions close at 4pm on Friday 20 February. – Enter any comments you want to make. One thing we’d really like you to say: it’s time to take any prospect of a Basin Reserve flyover off the table, and focus on developing better, more sustainable solutions! Oral submissions will be heard by the Regional Transport Committee on 9/10 March. We encourage you to make an oral submission if you’re available to do so. Save the Basin invites you to come show your love for the Basin Reserve on Valentines Day, Friday 14 February. Meet at the northern end of the Basin Reserve, near the CS Dempster Gate, at 10am to show your support for the iconic Basin Reserve precinct, and why it’s just too precious to spoil with the construction of the proposed flyover. Bring your banners, signs and anti-flyover T-shirts, but most of all your love for this nationally significant part of our city. Friday 14 February is also the first day of the New Zealand-India cricket Test at the Basin, so plenty of people will witness your declaration of love for the Basin! What’s The Basin Reserve Flyover Issue All About? 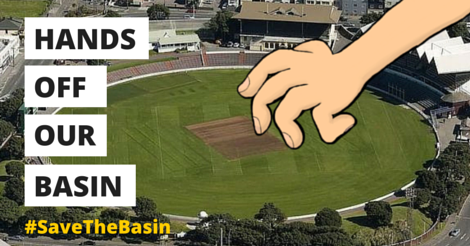 In case you’re new to the issue, here’s a quick introduction to what’s being proposed for the Basin Reserve, why the Save the Basin Campaign is opposed to it, and what you can do to help. The Basin Reserve is a recreation ground near the centre of Wellington. It is best known for being Wellington’s Test cricket ground, and has often been praised for its setting and its beauty. What’s proposed for the Basin Reserve? The New Zealand Transport Agency (NZTA), as part of the current New Zealand Government’s focus on building more motorways rather than funding public transport, walking and cycling, is planning to build a 10-metre-high one-way motorway flyover on the north-western boundary of the Basin Reserve at an estimated cost of at least $100 million. If built, it will be clearly visible from many parts of the ground. Hang on a minute, did you say “one-way”? It’s bizarre, but true. All this effort, expense and disruption is for the sake of a one-way road, running east to west. In fact, one of the many concerns about this proposed flyover is that it, if built, it may need to be followed by a second unsightly flyover running in the opposite direction. What effect would a flyover have on cricket at the Basin? Nobody is quite sure, but a number of senior international cricketers and cricket officials have expressed serious concerns at the potential effects on players, and also on the Basin’s future as an international cricket ground. We’re told that ‘mitigation measures’, mainly in the form of a new structure designed to block the view of the flyover from the pitch, have been agreed, though details have yet to be released of this agreement, but these measures don’t appear to shield the flyover from many fielders or spectators. Why does NZTA want to build a flyover? The NZTA is trying to convert the present route through Wellington to Wellington Airport into a motorway designed to carry increasing numbers of cars, even though traffic volumes are dropping. It wants to build a flyover as part of this route, and has been determined to do so for many years, despite a great deal of evidence (that will be presented at the forthcoming Basin flyover hearings) showing that a flyover is not necessary. NZTA has deliberately skewed figures to make other transport solutions appear not to be viable. Was there any consultation before NZTA went ahead with its plans? If you can call it consultation: NZTA gave Wellingtonians the option of agreeing to a flyover, or a slightly different flyover. NZTA ignored the many submissions calling for there not to be a flyover and then announced one of the flyovers as the preferred option. This is, sadly, typical of NZTA’s approach to engaging with the public. The Government has set up a Board of Inquiry to hear the resource consent application to build what NZTA persists in calling a Basin “Bridge” – presumably because it realises the public doesn’t like flyovers. The Board of Inquiry hearing is scheduled to begin on Monday 3 February and is expected to report by the end of May. Save the Basin Campaign and an number of other organisations are presenting detailed cases covering why a flyover is unnecessary and shouldn’t be approved. We hope that this Board of Inquiry will fully and carefully consider the question of whether the flyover should go ahead. However, the Government set up the Board of Inquiry process to fast-track projects it wants to see go ahead, and so far, that’s what Boards of Inquiry have done. If the Board rules that the project should not go ahead, it will have made the right decision. And if it rules otherwise, we still have other legal avenues open to us. You keep saying the Government is behind this project. Do all political parties support it? Absolutely not! In fact, five parties have stated their opposition to a Basin Reserve flyover: Labour, the Greens, New Zealand First, the Mana Movement and United Future. It’s entirely possible that the Government that emerges following the 2014 General Election may be opposed to a Basin Reserve flyover going ahead. Sign up to our email list to find out about coming events – email stoptheflyover@gmail.com and we’ll add you to our mailing list.